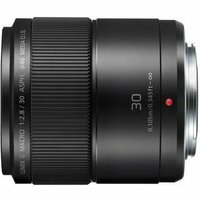 The Panasonic 30mm f2.8 Macro LUMIX G ASPH MEGA OIS lens with Micro Four Thirds fit is ideal for taking close-ups and life-size macro shots. Elegantly designed with a metallic black finish and strong metal mount, the lens perfectly matches the style of the LUMIX G interchangeable lens cameras and is ideal for day-to-day use. The Panasonic 30mm lens with 0.105m minimum focusing distance features a bright f2.8 aperture, MEGA O.I.S. (Optical Images Stabilisation), fast Auto Focus (AF) and a 1x life-size magnification to deliver stand-out close-ups with edge-to-edge sharpness. This lens is suitable for close-ups of flowers, food and insects and it's also ideal for portraiture, lowlight work and travel photography.